Clockwise from upper left: Mike Veino ’13 (from left), Jonathan Perry of the Aquinnah Wampanoag tribe, and Tommy Miller ’11 at the beginning stages of creating the wetu. 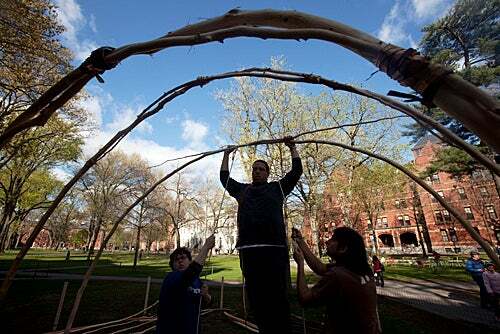 For the first time in more than three centuries, a Native American home stands in Harvard Yard. 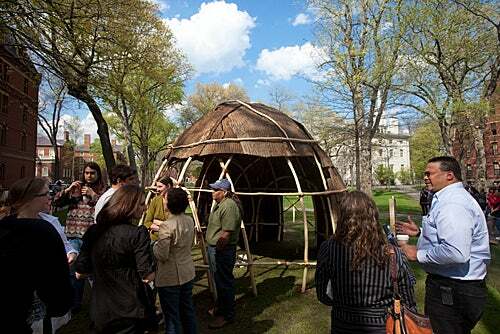 Over three days, a group of Harvard students built a traditional Wampanoag home, called a wetu, near the site of Harvard’s Indian College, one of the first buildings on campus, constructed to house students from nearby tribes. The structure, of a size that might have housed a small family, was built of traditional materials: long, thin poles lashed together with long strips of bark and sheathed in larger rectangular bark squares. It was left unfinished on one side to let passersby view its interior. 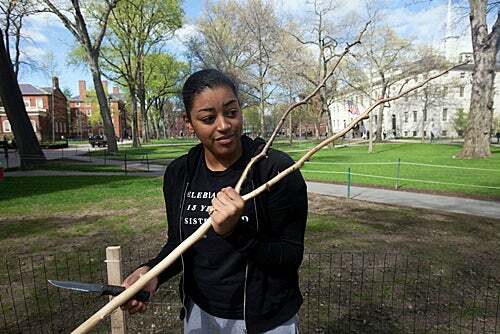 Kelsey Leonard, a senior and member of Long Island’s Shinnecock tribe, said the project was conceived as a way to commemorate the 360th anniversary of Harvard’s 1650 charter, which dedicated the institution to the education of English and Indian youth alike. In addition, Leonard said, the project was also intended to commemorate the Indian College, built in 1655, the foundation of which was uncovered last fall by an archaeology class digging in the Yard. Leonard was joined by other members of the student group Native Americans at Harvard College in the effort. 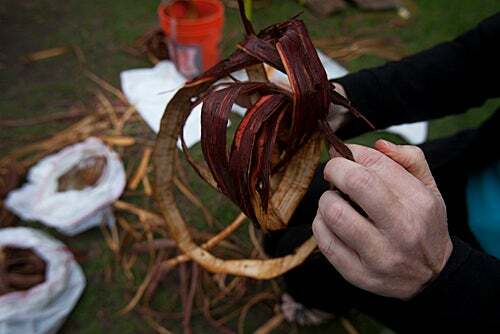 She said the work, which included stripping bark from the thin poles, was sometimes tedious, but “therapeutic.” The students labored in shifts, trading off tasks as they left to attend class. College administrators and officials at the Peabody Museum of Archaeology and Ethnology, who took a lead role in the Yard dig that unearthed the Indian College’s foundation, said that though they handled some of the logistical necessities, the project was largely student conceived and run. Leonard said that Harvard’s first Native American students were part of a cultural exchange between the English settlers and the local tribes as the two groups sought to understand each other better. The wetu will stand in the Yard through Arts First weekend and be dismantled on May 3. Tiffany Smalley, a junior and Aquinnah Wampanoag who co-directed the project with Leonard, said during the wetu’s opening ceremony April 22 that the project has made her optimistic about the future of Native Americans at Harvard and helped her understand a little more about her own native culture. “Personally, I’m learning more and more how to honor my ancestors and how to honor [specific] spaces,” Smalley said. The wetu was constructed with help from the Aquinnah Wampanoag of Gay Head, based on Martha’s Vineyard. Tribal council member Jonathan Perry directed the construction, providing traditional materials. Perry, who has worked on constructing traditional structures like wetus and dugout canoes for several years, said traditional wetus varied widely in size. The largest could stretch 200 feet and be 40 feet wide. Building them was typically a community effort, done by men. But women owned the structures in their matrilinear culture, with a man moving to a woman’s wetu after marriage, Perry said. The frame was typically constructed of cedar saplings, which are insect- and rot-resistant and considered a sacred wood. The floor was white sand. The thick outer bark sheathing of the structure was typically taken from chestnut and elm trees — giants of the New England forest that today have been devastated by disease. For the Yard’s wetu, Perry provided bark from poplar trees. Because native people moved with the seasons, families often owned two homes, Perry said. Because they spent most of their time outdoors, homes were relatively small, providing protected space for sleeping and shelter from harsh weather. To honor those people, students began construction with a ceremony acknowledging the native people who lived there. The wetu “is significant because of the fact that this place for thousands and thousands of years was home to many native people,” Perry said. 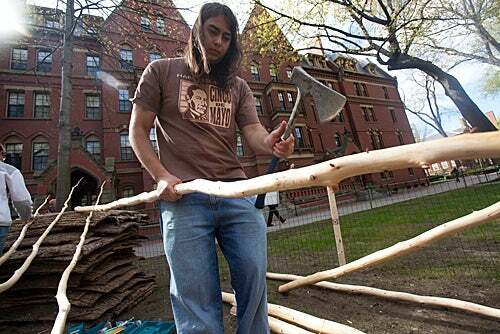 Mike Veino '13 (left) and Tommy Miller '11 help Jonathan Perry (center) construct a traditional Wampanoag home, called a "wetu," in Harvard Yard. Tiffany Smalley '11 assists with materials for the wetu. Poles were lashed together with long strips of bark and sheathed in larger rectangular bark squares. 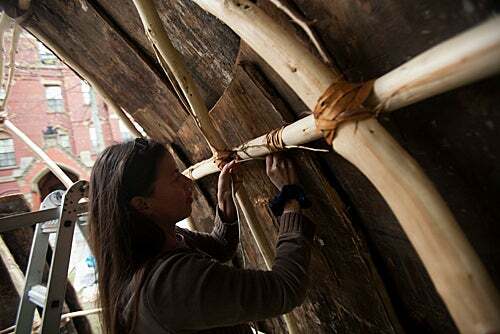 Aquinnah Wampanoag tribe member Elizabeth Perry helps fashion the inside walls of the wetu, which are made from thick panels of bark. Tommy Miller '11 tools around with the foundational poles for the wetu. Here, cedar bark is peeled and moistened before it's used to fasten the the wetu together. The wetu is open for passersby to check out its interior. It will remain on display through May 3. Provost Steven Hyman (far left) and other Harvard officials join the Murty family to celebrate the new Murty Classical Library of India series.